tician and member of the Knesset. The following paragraphs contain brief biographical sketches of these people. After the 1939 German invasion of Poland Shmuel, a native of Lutsk, was caught by the Nazis and forced into a labor camp. He escaped and hid in the forests of Poland. Eventually, Shmuel found his sister and, in 1946, they reached Palestine where Shmuel Shilo joined the Palmach, the elite strike force of the Haganah, the Jewish underground army during the period of the British Mandate. founded the Negev Theatre and was its art director. Shmuel acted in several movies as well as in television. He is best known for his role as Shmil in Rechov SumSum, the Israeli version of Sesame Street. Shmuel Shilo passed away on 4 October 2011, age eighty-two, and is buried on the kibbutz that he helped found – Kibbutz Tze'elim. Zalman Sorotzkin first arrived in Lutsk in 1930, when he was appointed Lutsk's rabbi. Prior to this appointment, Lutzker Rav, as he came to be known, had been the rabbi in Voranava, Belarus followed by a long stint as rabbi of Dziatłava, also in Belarus. While in Voranava, Rav Zalman established a yeshiva ketana (small yeshiva), for educating post-bar mitzvah-age students. Torah education of Jewish youth was a primary interest of the rabbi, to which he devoted much of his professional life. At the start of World War II, the Lutzker Rav was the head of the Vaad Hayeshivos – the yeshiva council; this was a period when many yeshivas had to relocate because of the hostile environment. When it became clear that things in Europe were becoming nasty, Rav Sorotzkin was encouraged to leave for Palestine. Once in Palestine, he continued his involvement with Torah education. Rav Sorotzkin was appointed vice-chairman of the Council of Torah Sages, Moetzes Gedolei HaTorah, the supreme rabbinical policy-making body in Israel; the Council has considerable political power. Rabbis appointed to this council either are prestigious heads of yeshivas or are Hasidic Rebbes. 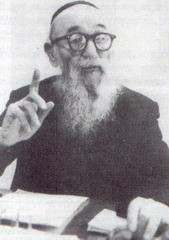 The Council of Torah Sages established, in 1953, the Independent Education System of Israel – Chinuch Atzmai – headed by Rav Sorotzkin. This alternative school system is designed to serve the needs of the ultra-orthodox Jews of Israel. Rav Zalman Sorotzkin, who came a long way since his 1881 birth in Žagarinė, Lithuania, died in 1966, at the age of eighty-five. He was the author of numerous books, most notably his Oznaim LaTorah, a well-regarded commentary on the Torah. After graduating from high school in Lutsk, where he was born in 1907, Dr. Unichman received his medical degree from a Prague University. During Unichman's stay in Prague, he became involved in Betar – the right-wing zionist youth movement. It wasn't until 1935 that Dr. Unichman arrived in Palestine, where he assumed command of a Betar mobilization platoon. Shimshon Unichman also became involved with Hatzohar. Founded by Jabotinsky, Hatzohar resisted Chaim Weizmann's policy of appeasing the British in Palestine. In 1944, the doctor was arrested by the British and was imprisoned in Eritrea, on the horn of Africa. After independence Shimshon joined Herut and was eventually elected to the Knesset where he served until his death in 1961.